In what can only be described as the most terrifying prediction of the year, scientists believe that Ebola will be in France and the UK by October's end. 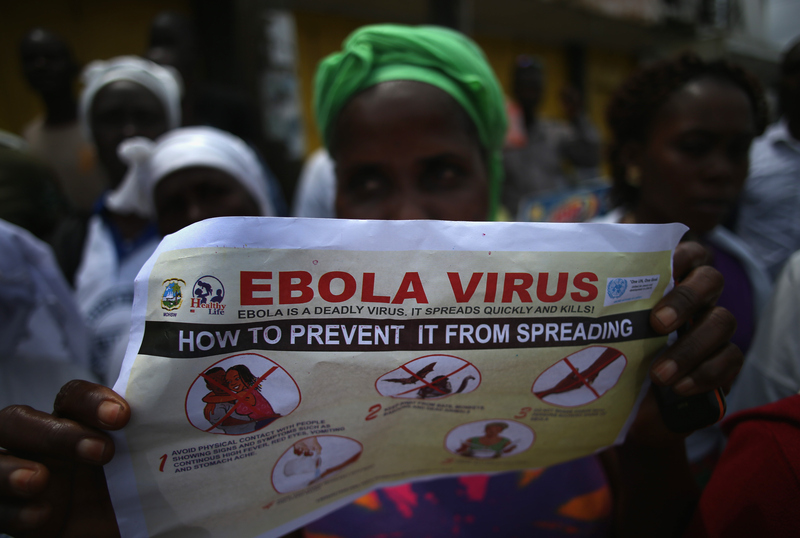 By using existing Ebola spread patterns and air traffic data, scientists have predicted that there is a 75 percent chance that the virus will be in France by October 24, and a 50 percent chance that Britain will also be affected by then. Those two countries alone represent 130 million people, or nearly 20 percent of the European population. As the Ebola situation worsens in its West African origins, the rest of the world grows increasingly on edge with reports of what appears to be an inevitable global epidemic. While these 75 and 50 percent estimates are based on air travel remaining at current levels of full capacity, even with an 80 percent drop in traffic, France still stands a one in four chance of being infected, while the UK will have a 15 percent chance of seeing the disease emerge in its territories. The World Health Organization has yet to place any discrete restrictions on air travel, but British Airways and Emirates have grounded some flights to the worst affected regions. Researchers are most concerned with France and the UK because of their proximity to the disease as well as their positions as major travel hubs. France has considerable ties to three of the hardest hit countries, Guinea, Sierra Leone and Liberia, where French speakers are constantly en route between the African countries and Europe. Heathrow Airport in Great Britain, on the other hand, is one of the biggest airports in the world. In 2012, the Guardian reported that London Heathrow was the single busiest airport in Europe, servicing nearly 70 million people, a 5 percent increase from the year before. Given that the disease has already reached the United States, which is much further removed from the center of the disease than these European nations, it seems like an inevitability that Ebola will make its way across the Straight of Gibraltar. If this thing continues to rage on in West Africa and indeed gets worse, as some people have predicted, then it's only a matter of time before one of these cases ends up on a plane to Europe. And this is particularly worrisome because people are often unaware that they are carrying the disease when they travel, as may have been the case with Thomas Duncan, the Liberian native who is being treated for Ebola in a Dallas hospital. Though Duncan may have lied about having come into contact with someone who had the virus, it is unlikely that he was aware that he was infected himself. Given the 21 day incubation period of the disease, many patients can remain asymptomatic for weeks, allowing them to go about their daily lives as normal, before falling ill and becoming contagious. In the European Union, where travel between nations is virtually unrestricted, this free movement of citizens may pose a significant public health risk. Jonathan Ball, a professor of molecular virology at Britain's Nottingham University, told Reuters that "cases can slip through the net" despite screening systems. This means that travelers could potentially come into contact with several people throughout a number of countries before realizing they are carriers of the virus. It's not just the UK and France that could be infected. Belgium stands the next highest chance at 40 percent, and both Spain and Switzerland have a 14 percent chance of seeing Ebola emerge on their shores. This is not a deterministic list, it's about probabilities - but those probabilities are growing for everyone. It's just a matter of who gets lucky and who gets unlucky. But the good news is, even if Ebola does spread to these European countries, the chances of a full-blown outbreak remain very slim. European outposts of the Centers of Disease Prevention and Control have said, "...the capacity to detect and confirm cases...is considered to be sufficient to interrupt any possible local transmission of the disease early." After all, Nigeria has contained the disease remarkably well, and was recently declared Ebola free by the United Nations. People aren't living in very crowded conditions (in Europe), so the disease doesn't have the same environment it has in a shanty town in Monrovia, where the environment is perfect for it to spread. It's a different matter in modern western cities with the very sanitized, sterile lives that we live.